This is one of my occasional commentaries on ceramics. While 2009 was a year of no great significance in the world of ceramics and for the Washington Oriental Ceramic Group (WOCG), interesting events happened and are reported below, from my pottery perspective. The Washington Oriental Ceramic Group had another good year with eight events in members’ homes and at the Freer and Sackler Galleries (FSG). Perhaps the biggest deal was our participation in the launch of the online website catalogue of the “Taking Shape”, FSG’s exhibition of ceramics from mainland Southeast Asia, an event broadcast around the world. The online catalogue is designed as a reference tool to be used anyplace and anytime. View the virtual catalogue or relive the launch. Our handling session in Freer Storage of Ming and Qing dynasty imperial wares was over the top. Such great stuff! We had three programs focusing on Southeast Asian ceramics -- Thai, Vietnamese and a survey of all mainland Southeast Asia wares. We traveled to Washington and Lee University to check out its extensive collection of Chinese porcelain made for the West. Then several months later we followed up on that trip with a meeting at Marcia Feinstein’s gallery of 18th-19th century Chinese porcelains made for the Europe and American markets. Another popular event was the Asian silver “show and tell” session where members brought and discussed their silvery examples. If we make it though the rest of 2010 we can celebrate the WOCG’s 25th anniversary since starting in 1985. 2) The Freer and Sackler Galleries. The WOCG benefits greatly from our relationship with the FSG and particularly the guidance and support of Louise Cort, the FSG’s gracious and knowledgeable ceramics curator. The FSG’s attendance held up well in 2009, averaging about 80,000 a month or nearly one million for the year. Proving that the FSG’s combination of Oriental art, Whistler and turn-of–the century American pots and paintings continues to be a great draw. Also having free entrance undoubtedly helps. This attendance total is greater than FSG’s neighbors, the Hirshhorn and African Art museums. As you know, internet use is up everywhere including at the FSG, where last December online visits surpassed 250,000. Currently four ceramic exhibitions are up at the FSG showcasing Chinese, Japanese, Korean and Southeast Asian pots. A fifth on Vietnamese wares was taken down late in 2009 after a run of several years. Ceramics being such visually accessible art objects certainly plumped up attendance. Underlining the tough financial climate facing most all cultural institutions, the sizeable financial endowment that Mr. Freer gave to the Freer Gallery a century ago was $87.7 million at the end the FSG’s FY 2008, down nearly 18 percent. Not too long ago the Federal government’s funding covered 70 percent of FSG expenses, leaving 30 percent to come from FSG’s resources. Now with the Feds facing an enormous deficit, that ratio will soon be turned on its head with 70% to be furnished by the FSG and 30% from U.S. tax payers. Separate from that eight-figure endowment, fortunately, the FSG has great friends and specialized endowments, which allowed it to opportunistically buy at auction last autumn a distinguished Japanese cultural object. This 13th-14th century South Chinese tea-leaf storage jar, (H- 16 inches/41.8 cm) was used by Japanese cultural and political elites from the 15th century. 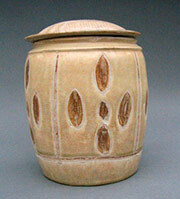 It joins the FSG’s distinguished collection of early, pre-modern Southeast Asian, Chinese and Japanese storage jars. Think of it like a bottle of French wine owned by Thomas Jefferson or a Chinese porcelaindish used by George Washington. 3) Interesting events – West Hemisphere. No question that the premier Asian ceramic cultural event was the reinstallation and opening in April at the British Museum of the Percival David Foundation Collection of nearly 1700 Chinese imperial and other ceramics in a well-designed special purpose-built gallery. The PDF remains the outstanding collection of Chinese imperial wares in the West. Housed at the London University for decades, this expensive move assures a much wider audience for this unsurpassed and now user-friendly collection. On the other hand, the Victoria and Albert Museum’s reinstallation in London of its outstanding collection of old and new ceramics from around the world sadly disappointed. Unfortunately, the V&A decided to show their pots chronologically, which resulted in a visual mishmash of colors, styles and nationalities. Putting 15th century Vietnamese wares next to European pieces of the same century only confuses. There are no insights in V&A’s new and confusing presentation. Notwithstanding a difficult economy, potters persevered, although sales were down substantially last year. The Seagrove, North Carolina, colony of 90-some potteries working within a tradition dating back to the 18th century, and the cluster of high class-Japanese influenced potters around Charlottesville, Virginia, were perhaps typical. Often with a spouse furnishing a steady income or teaching to support their work, artist potters turned out lovely, durable, imaginative and at times memorable pots. North Carolina officialdom and local colleges gave support with exhibitions and publicity. For example view http://www.ncpotterycenter.com/. Making ceramics is a way of life but not a way to grow rich, or put kids through college. Cambodia’s emergence from its civil war. A trip to Phnom Penh and Siem Reap confirmed the renaissance of Cambodian archaeology, and a tentative florescence in museums. Building on earlier fundamental work done by French scholars, young Cambodian, French and Australian archeologists digging near the Angkor reserve and investigating the extensive network of mediaeval Angkorian roads are uncovering ancient kilns and unknown towns. At a new Japanese-supported museum in Siem Reap the eye-opening results of recent scientific excavations were on display -- dozens and dozens of greenish creamy ash-glazed stoneware covered boxes from the 11th-12th century. They will soon be moved to their new kiln-site museum at Tani, near Angkor. Known for its shopping, food and work ethic, this island state now shows the results of major investments in culture. The Asian Civilizations and the revitalized Peranakan museums present exceptional Southeast Asian pots, textiles and jewelry and spectacular Chinese porcelains made for rich Malayan Chinese. 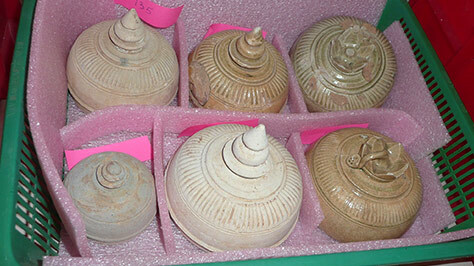 Although Singapore continues to hold out of sight the 60,000 Changsha wares from a 9th century shipwreck off Sumatra which cost US$30-40 million, hopefully some will go on view next year. While much construction stopped during the 2009 recession, Singapore Inc. did not slow the construction of several enormous shopping, convention and gambling complexes which will house the ceramics. One hopes that some of these pots from this famous shipwreck cargo will be loaned out, so the rest of the world can share these Chinese stonewares. Chinese cultural footprint grows as its financial reserves balloon. In January 2009, the US and China entered into a bilateral agreement that imposes import restrictions on categories of archaeological material essentially from the Paleolithic period through the Tang dynasty (75,000 B.C. – A.D. 907). Originally the Chinese government wanted to have these restrictions extend to 1911. The Chinese have emerged as the greatest buyers of Chinese art objects everywhere. This is the product of the great new wealth in China and a buying surge representing recovery from its Cultural Revolution. While there is important increasing cooperation between major US and Chinese museums, the Chinese are exhibiting “jingoism” and “grandstanding” regarding its cultural patrimony in overseas collections, according to the director of the Metropolitan Museum of Art.